This is a dish that really exemplifies the wisdom of Greek-Mediterranean cuisine. 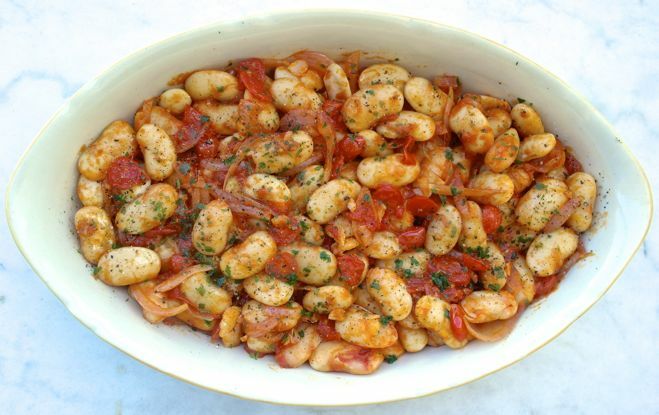 Beans were one of the main ingredients in the traditional Mediterranean diet, particularly for Greeks who due to the long periods of religious fasting (over 200 days a year) that prohibited most animal products, beans were the main source of protein. 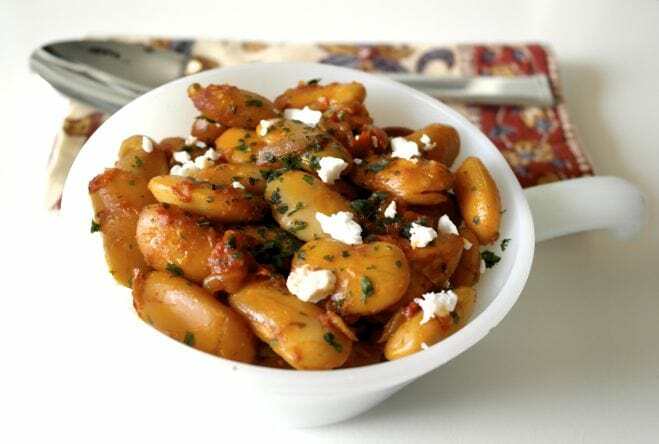 As a result, Greek cuisine has several bean dishes as main courses. One of them is known as Gigantes Plaki. Gigantes are a type of large white bean, the word gigantas in Greek means giant. Gigantes from several areas of Greece have a Protected Geographical Indication status due to the unique environment that these beans are grown in. If you can find these beans it is worth a try otherwise butter beans wil work. 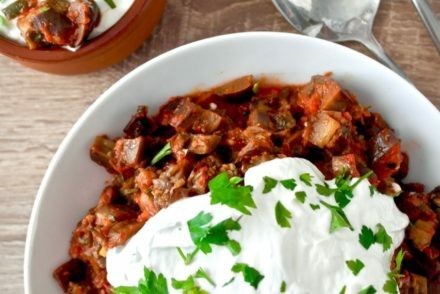 This recipe combines beans which are of course a great source of protein, antioxidants and fiber, while the addition of tomato not only makes them tastier but the vitamin C in the tomato helps increase the absorption of iron from the beans. 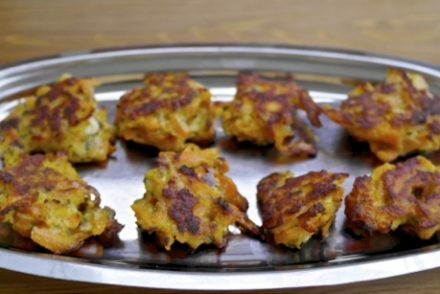 Plaki refers to the method of cooking which means basically baking in the oven with a sauce made with tomato, onion, garlic and parsley. The recipe is easy and even though the cooking time is somewhat long, active prep time is very short. You basically soak the beans in water overnight, boil them, prepare an easy sauce, mix everything together and bake. 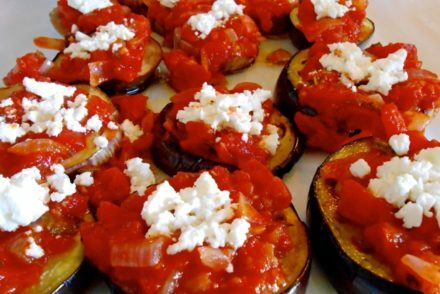 This is a delicious dish that is more recently served as an appetizer to accompany an ouzo or other drinks, but it is a complete meal and it is vegan. If you eat dairy it goes wonderfully with feta and the always present, slice of bread. Soak the beans overnight, the longer, the better. Drain and rinse the beans and boil in water for about 40 minutes to an hour, until they are soft but not mushy. Make sure you boil them enough; otherwise the beans will be too hard to eat even after baking. In the meantime prepare the sauce. Sauté the onion in a bit of olive on low heat until soft and add the garlic cloves whole. If you want a stronger garlic flavor you can mince the garlic. Add the tomato (this time I used cherry tomatoes that I cut in thin slices, but the traditional way is grating the tomato), the tomato paste, parsley, salt and pepper to taste and about ¼ cup olive oil. Let it simmer until sauce thickens, about 10 minutes. Once the beans have boiled, drain them and put them back into the pot, add the sauce and mix gently. Pour the mixture in a pan and spread evenly and then pour about another ¼ cup olive oil over the beans and bake for about 40 minutes until beans are tender. I have been ( bean) growing these Gigantic Greek beans for several years and bought my first bean seeds from the Real Seed Co. in Pembroke. When you harvest them you keep the biggest 20 or 30 beans to replant and dry them on top of the central heating boiler. Use a metal tray with some kitchen roll or an old cloth so that there is not too much direct heat. The drying time is about 3 to 5 days. Keep the seeds in thick envelopes in a dry cool dark place for the next spring . Treat the bean plants as you would runner beans. i.e. they are susceptible to frost . Start them inside or in a greenhouse and plant out at the end of May or early June. Harvest the beans around the end of September when the pods have turned brown. It is an immensely rewarding experience to grow your own food and then cook and eat it with friends and family. Awesome! The only way I’ve been able to get my fix has been those expensive little Zanae cans. This is a game changer!!! Canned beans are fine too. Just watch out for the salt. What a brilliant recipe. Reminiscent of Kefalonia, thanks a lot! small back yard of a village house with vine covered pergolas. A large plate of gigantes, dolmades, feta cheese drizzled with a little oil Kalamata olives, fresh bread and a bottle of chilled retsina or ouzo, and for good measure some gentle bouzouki in the background.That’s what I am going to do a little later this year. Thanks Yanni! A wonderful meal and scene indeed! I completely agree with that! Oh how I miss living in the Mediterranean! The picture Yanni painted in my mind took me back. I, too, as Dylan said, the only way I have been able to enjoy them until now is in the can. Not bad, but I’d MUCH rather have control over the salt that goes into it. I can’t tell you how excited I am to have found this recipe! I have my beans soaking now and I look forward to an amazing dish tomorrow! Feta, some fresh made dolmas, and fresh bread. I am SO back in the Mediterranean! Now, I will have to try making it myself at home. Any idea if Fava beans would work? At times i have trouble finding large white beans in California. I just put it in the oven. This makes the fifth time I have made this recipe it is absolutely delicious!!! 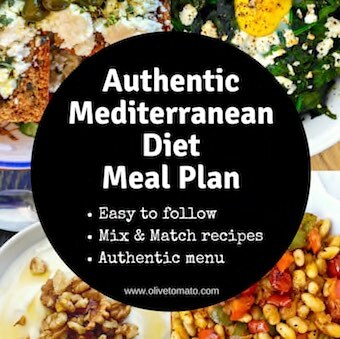 I’ve been using your recioes since discovering your site 4 months ago, and have cooked nothing but Greek foods they are wonderful thanks for sharing! Reeshiez, You can look for broad beans or lima beans. 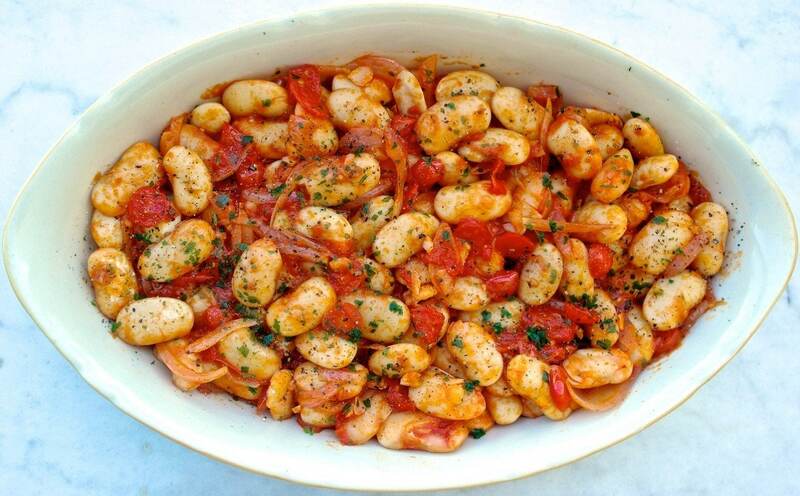 Or you can try the recipe by just using regular white beans too. Just grow your own. They are easy grow – just like runner bean but you leave them on the vine until they they mature. They are available online from Real Seeds. I am trying this dish for the first time, I found the beans fresh at my local grocery store, when I take them out of the pod do I still have to soak them like the dried beans and boil them or can I skip those two steps and go right to baking them in oven………Thanks. Since they are fresh they would probably not need soaking. But I would still boil them, perhaps for less time, until they are somewhat soft. Not in my area Aldi markets, they’re not carrying gigantes! 🙁 They, however, are expanding their organic produce, seeing more and more organics, thankfully, so I am visiting more often. Maybe I’ll speak with managers and ask if Gignates are available. Thanks! Greetings from Canada. I made this dish today. Thanks to your recipe it was amazing. I haven’t had this food in over 25 years and it tasted exactly how I remember eating it in Greece. Yummy! Hope you enjoyed it! At what point should the beans be shellled? Or isn’t that necessary? Hi Pat, No you do not need to shell the beans. Hello! I have recently stumbled across your site and am a huge fan so far! If you were going to serve this as a main dish, what would you recommend to go with it? Hi Kara, I would serve this with cheese (feta), bread and it would also go well with cured or fresh sardines or anchovies. Or yu could a pita (pie) like spinach pie or cheese pi. These beans are SO delicious! I made them a few weeks ago and meant to say so…but I’m making them again today. Going to use some smaller white beans as I have them on hand, and the big ones are rather pricey here in Japan. They flavors are simple but great, so I’m sure they’ll still turn out great. Thanks for your delicious recipes!! Elena, this recipe is delicious! I think it is the third time I’ve made it and this was the best ever. I used two sweet onions and cooked them over low heat while the beans cooked. 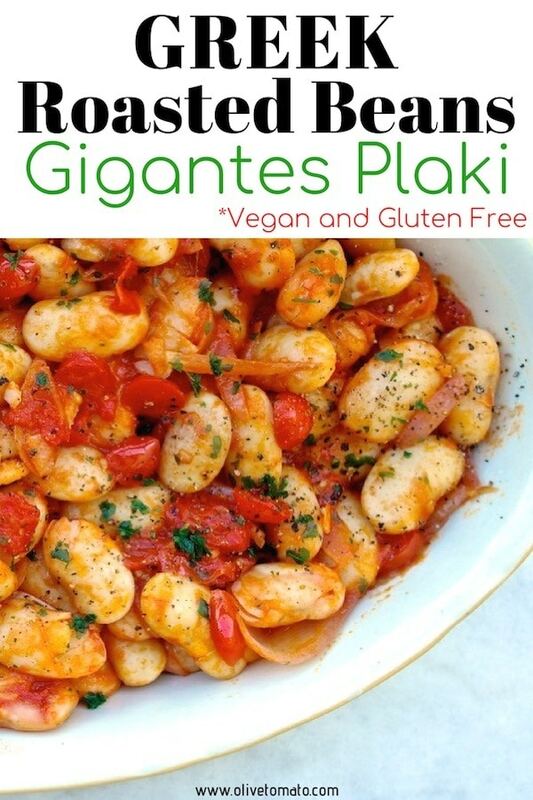 I order dried gigantes from an online Greek store since we don’t have a Mediterranean grocery store in my town. I really love your website. I have made many of your recipes and each has been exactly the way we enjoy eating in our home. Thank you so much for the time and care you put into your posts. By the way, I have the identical bowl that you show in the second picture (the white one with the handle). It’s been in our family since I was a little kid! I would like to” can” or pressure can this recipe . Has anyone ever tried to do so? When I soak the beans I get partially separated skins that look and feel like stiff plastic. It takes a lot of time rubbing and sifting to try to get them all out. I do not see mention of the skins in your recipe, do you usually just leave them in the dish? After you boil them, drain and rinse and you can remove any skins at that point. BEST DISH I”VE EVER MADE!!!! You can order dried beans from Rancho Gordo in Napa, Ca. They carry several types of white beans. This is only place I order beans from. Also, I love your website!! Thanks for the tip Gail! All I could find at my local market was canned butter beans. With canned beans, do you still go through the soaking overnight and boiling process? First timer to one of your recipes. This looks delicious and will be trying. I just have a few questions before beginning. Have you ever used canned tomatoes? If so, would it be the 14.5 oz can? The recipe calls for 3/4 c olive oil. I only account for 1/2 c, specifically in steps 5 and 6. When you first sauté the onions, is the “bit” of olive oil referred to the other 1/4 c? Yes, the other 1/4 cup olive oil is in step 4 where you saute the onion, you can use a bit less if you wish. Generally the olive oil is added liberally in this dish. Canned tomatoes are fine, I use them in many other recipes and they would work well. Hi Elena – when using canned tomatoes, how many ounces or cups should I use? About 10-12 ounces crushed tomatoes. Can this be prepared in advance and baked the next day? I have made these three times. Delicious!